At around and off rue de la Huchette lie tons of Greek restaurants/eateries. 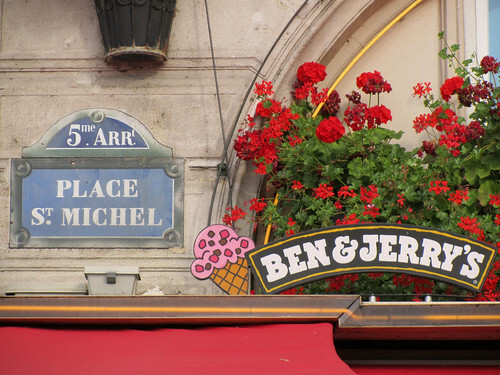 However, since I have not eaten there personally, I couldn’t tell you if they are any good or mere tourist traps, given it’s location between St Michel and Notre Dame with plenty of foreign foot passengers daily. 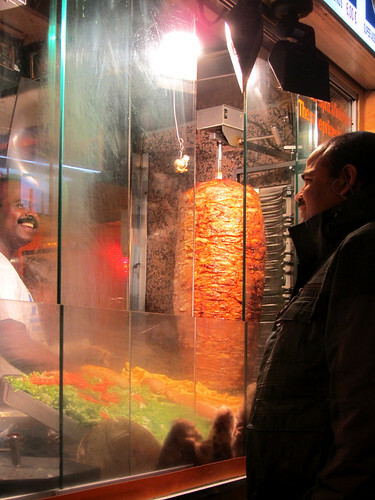 Invariably, every 3-4 doors down along the streets, you’ll be treated to a view of kebab/gyros in preparation. I quite like this shot, which is a completely lucky shot. I was photographing the street initially, until this man came along and started chatting with the vendor. In a split second decision, I aimed my camera over and “click”. Not exactly the wisest move under dim condition, but I think this hasn’t come out too badly. I was worried it would be blurry, but no, it seems photography god is on my side today. Hurrah! 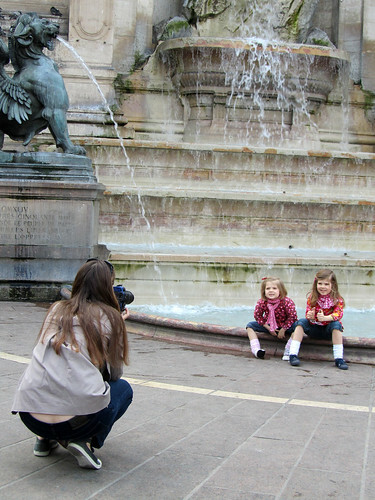 I’m starting to think of Place St Michel as “city centre” of Paris and location of choice for many meet-ups . A little bit like the front gate of Trinity College in Dublin kind of thing. It’s easily accessible by public transport, has iconic meeting point (the square in front of the fountain), widely sign-posted and hard to miss while at the same time easy to spot people. Perfect.